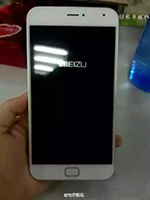 Alleged live photo of Meizu MX4 Pro made the rounds online. The image of the Meizu MX4's more capable sibling appeared on the Chinese social network Weibo. The latest Meizu MX4 Pro appearance falls right in line with a past cameo. The image showcases the device in white and allows us to take a look at its rumored fingerprint scanner. Meizu MX4 Pro is expected to debut in the near future. Its alleged specs include 5.4” QHD display, Exynos 5 Octa SoC, 20.7MP camera, and Android 4.4 dressed in Flyme OS user interface. will there be FM and what will be the price of 16 gb mx4 pro? mx4 design is the best ever. i hope it will return with mx4 pro. I never say crap like that butwhat do you get when you combine s4 with iphone 6? This!